The all-new Audi RS 5 Coupé goes on sale this month priced from £62,900 OTR - with first deliveries later in the summer. UK-bound examples will benefit from an enhanced specification, with the Audi Virtual Cockpit and Audi sport differential featuring as standard. 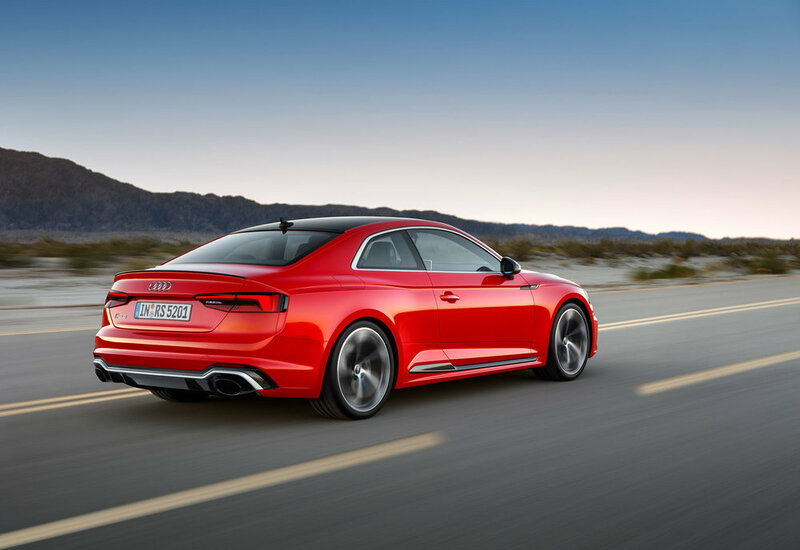 The new high performance RS 5 is powered by a 450PS V6 biturbo TFSI with 600 Nm of torque. The new 2.9-litre engine holds a 170Nm advantage over its naturally aspirated predecessor and offers the RS 5 a 0 to 62mph time of 3.9 seconds and, with the optional dynamic package, can reach a top speed of 174mph. Aided by a 60kg overall weight reduction versus the outgoing car, the V6 biturbo is capable of up to 32.5mpg combined, corresponding to 197 grams of CO2 per km – an efficiency gain of 17 percent over the previous model. The biturbo’s power is managed by the eight-speed tiptronic transmission with optimised shift times and by the reworked five-link front and all-new five-link rear RS-specific suspension, which is supported by quattro permanent all-wheel drive. The centre differential-based system distributes drive forces in a 40:60 front-to-rear ratio favouring 'dynamic handling with optimal traction', and in UK spec models it's augmented by the quattro sport differential, which also apportions torque optimally between the rear wheels to promote even greater handling adjustability. Pronounced air intakes, oval exhaust tailpipes, quattro 'blisters' complementing widened wheel arches and an exclusive honeycomb design for the single frame grille are among the features that mark the updated A5 as an RS model. The look can also be further enhanced by new features such as a full carbon roof and by bundled appearance packs that accentuate the sill strips, mirror cappings and diffuser insert. The standard LED headlamps with their dynamic scrolling indicators can also be upgraded to Matrix LED units capable of intelligently diverting their high beam around oncoming and leading traffic for maximum illumination. Finally, the 19-inch alloys can be upgraded to sizeable 20-inch wheels. On the inside, fine Nappa leather-upholstered RS sport seats position the driver ‘perfectly’ according to Audi, in relation to the flat-bottomed multifunction sport steering wheel and the tiptronic selector lever with its RS insignia. When the start button is pressed, the RS-specific, fully digital Audi Virtual Cockpit come to life. This standard feature of UK RS 5 models features a customisable display incorporating special RS screens providing information on tyre pressure, torque and g-forces. The list of driver assistants that feature as standard also includes the side assist blindspot monitoring system, hill hold assist and the drive select adaptive dynamics system offering fine-tuning of engine response, transmission shift points, steering weighting and the operating characteristics of the quattro system and sport differential. 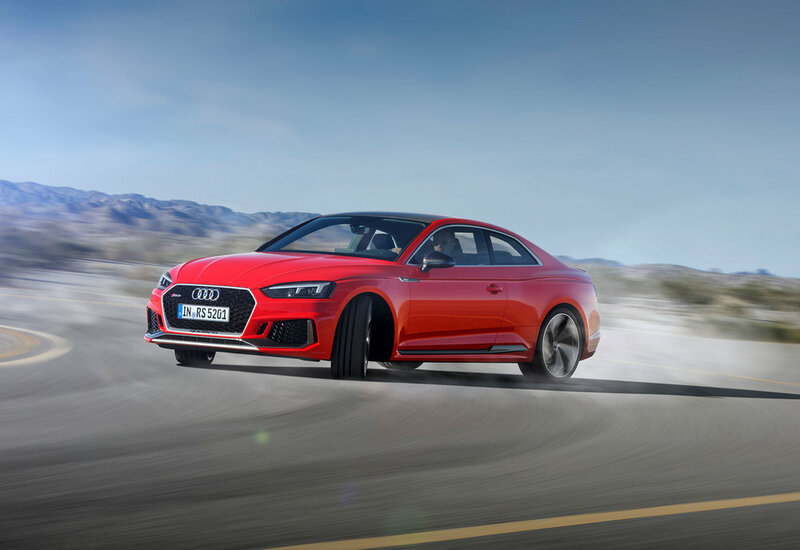 On the infotainment front, the RS 5 Coupé comes equipped as standard with the Smartphone Interface bringing Apple Carplay and Android Auto on board, and with MMI navigation plus with MMI touch, which now also includes LTE internet connectivity as part of the Audi connect package. Thanks to the embedded Audi connect SIM, the flat rate data package for the connect services including Europe-wide roaming is free of charge for three years. Further high-end technologies, including a head-up display and as many as 30 driver assistance systems are available from the options list to help leave drivers 'free to immerse themselves as fully as possible in the performance'.